Wood framing, or light frame construction, is the assembly of dimensional lumber or engineered wood lumber that is regularly spaced and fastened together with nails to create floor, wall and roof assemblies. 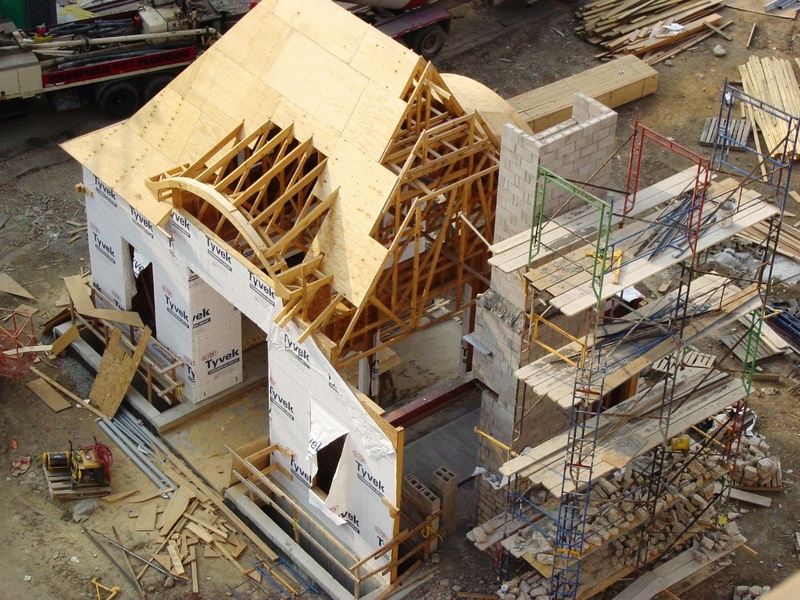 Wood is the most common material used within the construction industry today. Floor, wall, roof and stair assemblies are each made up of specific dimensional wood components, similar to a skeleton. These components are fastened together to form the structure and allow the interior spaces to function as desired. The following list identifies and describes each component within each type of assembly. 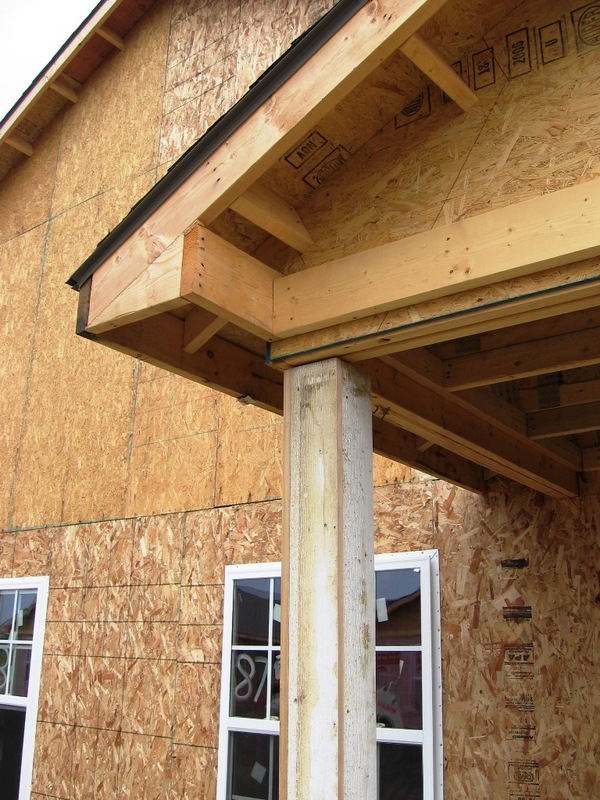 The sill plate is a wood member, typically made from treated wood, attached to the top surface of the foundation. Joists are fastened to the sill plate. 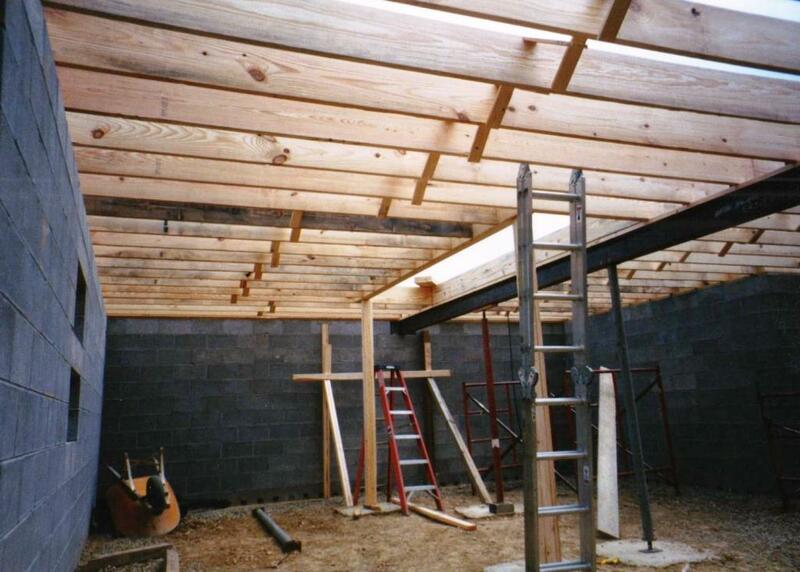 Rim joists are a series of similar sized wood members which are placed around the outside of the floor structure. They are laid on their narrow end and attached to the sill plate. 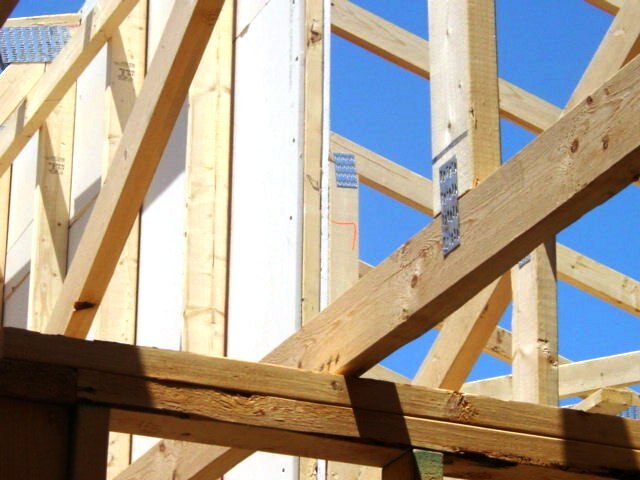 Floor joists are wood members or engineered wood products (typically the same size as the rim joists) which are placed on their narrow ends, spaced uniformly, and attached to the sill plate. 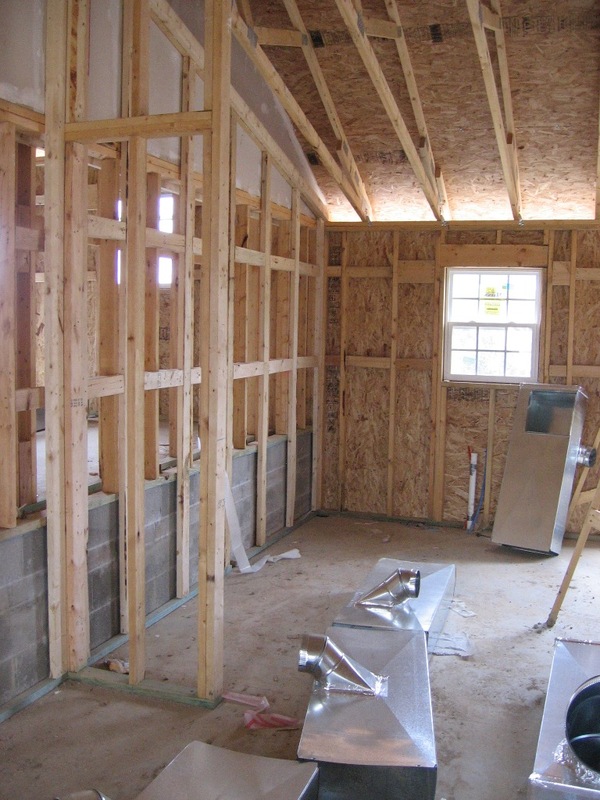 The subfloor is attached to the floor joists, and they carry the floor loads to the load bearing walls. 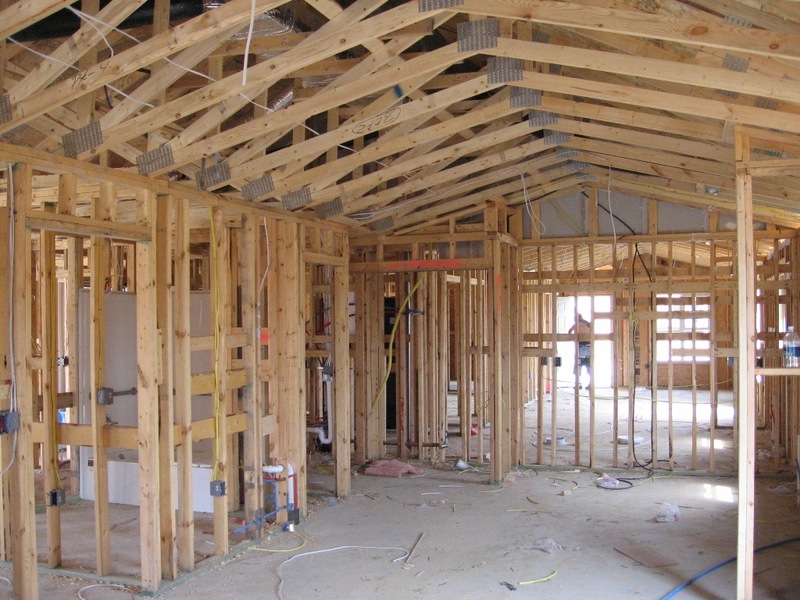 A header is made of multiple wood members attached to each other and is used to frame an opening in the floor assembly, interrupting the joists. 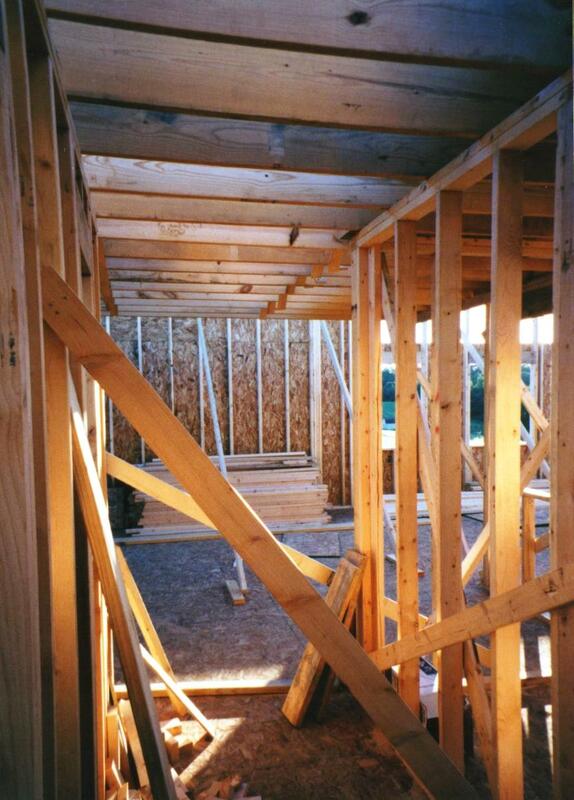 Bridging consists of small wood members that are fastened between joists, providing lateral stability. A bottom plate or sole plate is a horizontal wood member at the base of the wall, fastened to the floor frame. Studs are vertical wood members, spaced evenly apart, and attached to both bottom and top plates. Typical spacing is 12", 16", or 24” on center. A header is made of multiple wood members and placed over an opening. It is attached to adjoining studs and evenly distributes building loads around the opening. A sill is wood member under an opening, attached to adjoining studs, that supports a window. 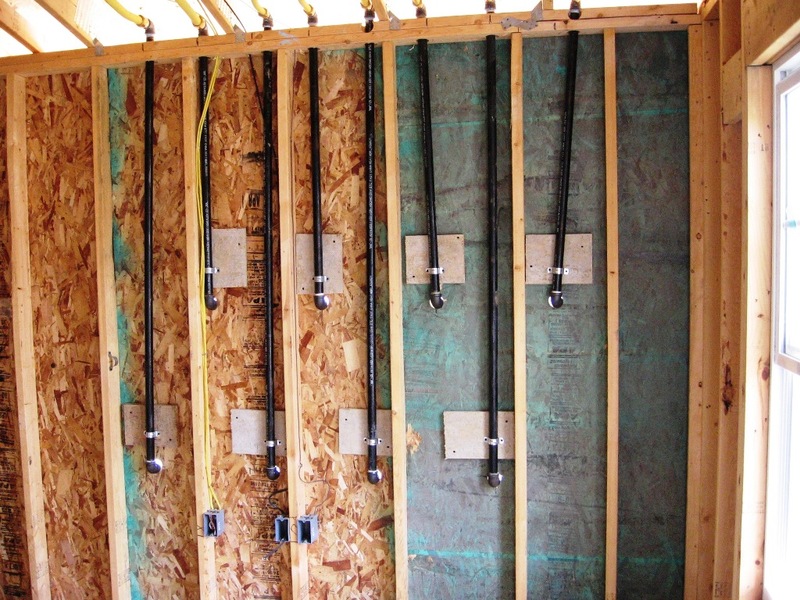 Blocking refers to small wood members that are fastened between studs for the purpose of attaching finish hardware or blocking the spread of fire within the wall cavity. The top plate is a horizontal wood member at the top of studs. The king plate is a secondary plate fastened to the top plate, used to interconnect corners and interior wall frames within a building. 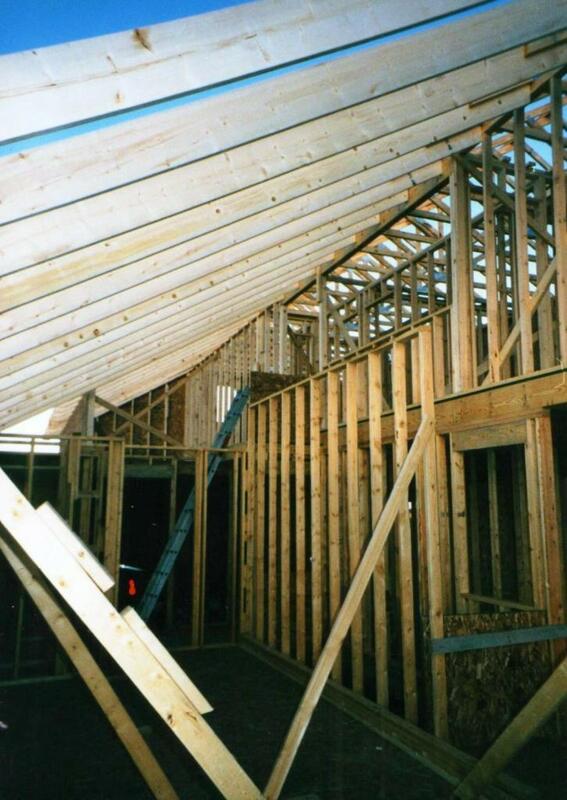 Rafters are diagonal wood members, spaced uniformly apart, to which the roof sheathing is attached. 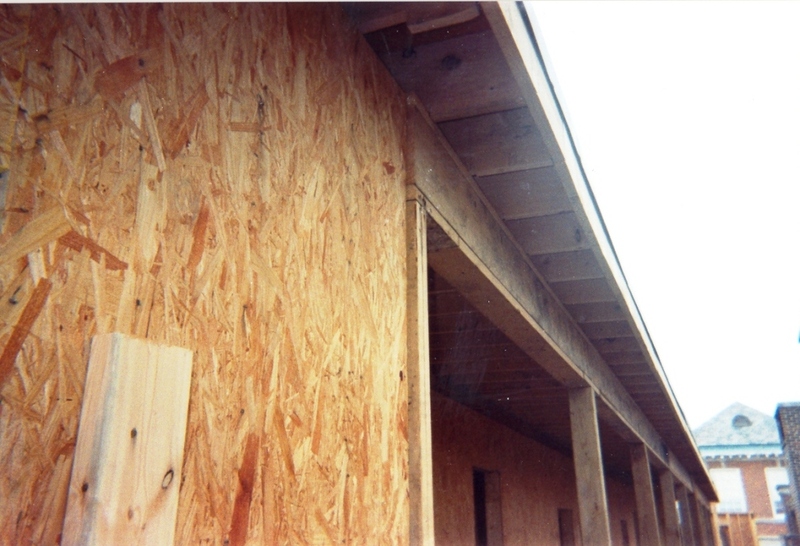 Typical rafter spacing is 12", 16", or 24” on center. Their angle is determined by the designed rise and run of the roof surface. 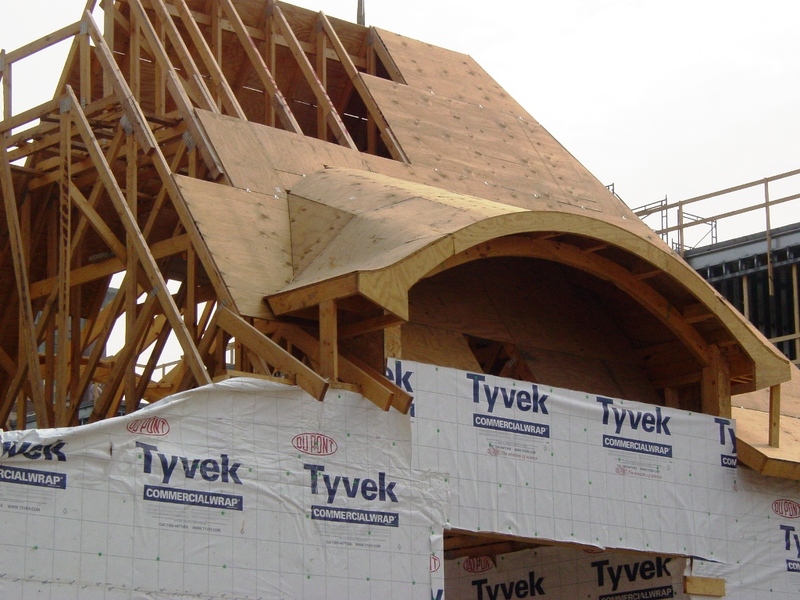 Various types of rafters are used to form the desired roof shape and style, including the common rafter, hip rafter, valley rafter and jack rafter. 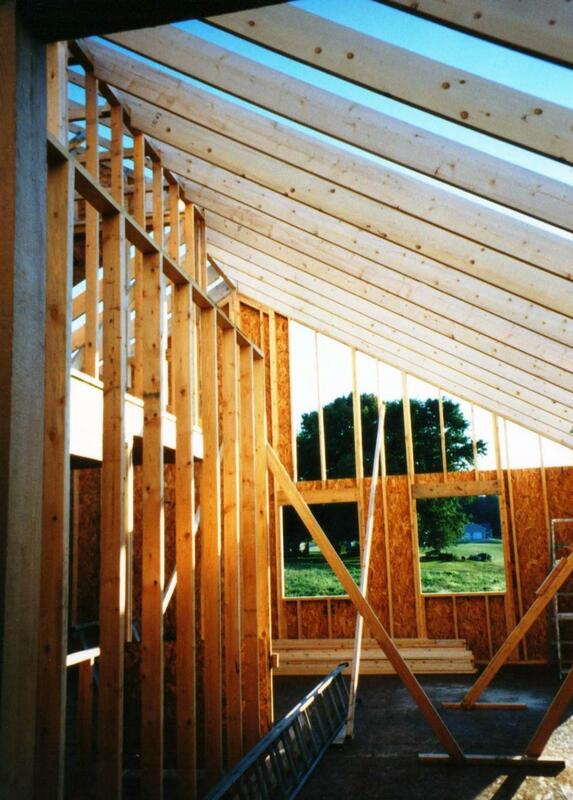 A ridge beam is a horizontal wood member at the peak of the roof to which the tops of the rafters are attached. 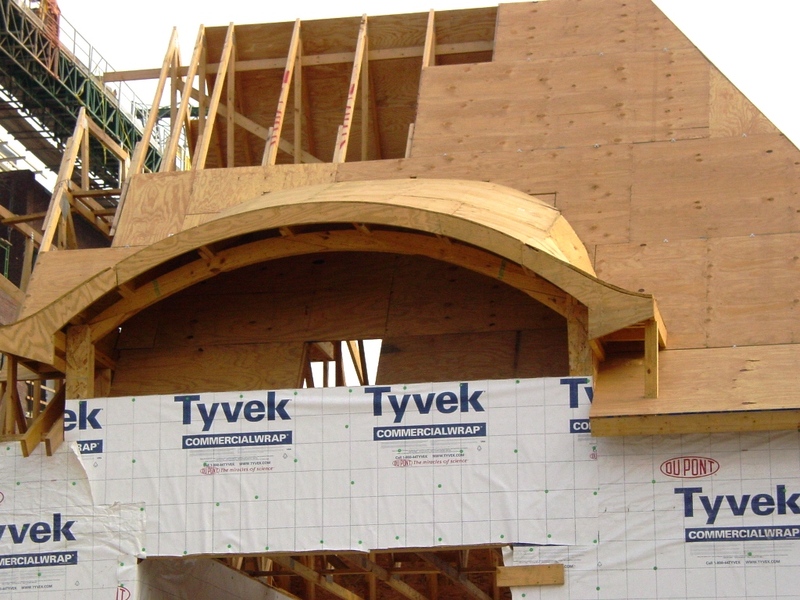 A collar beam is a horizontal wood member between rafters, providing vertical stability across diagonal rafters. 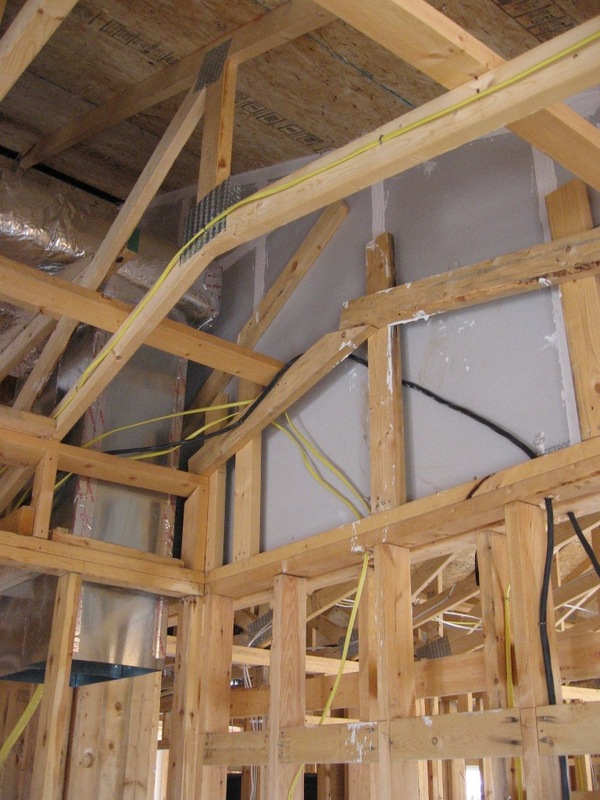 Ceiling joists are wood members which serve a function similar to floor joists, framing the ceiling of the top building story and the floor of the attic above. Fascia boards are attached to the bottom of the rafters to add lateral stability. 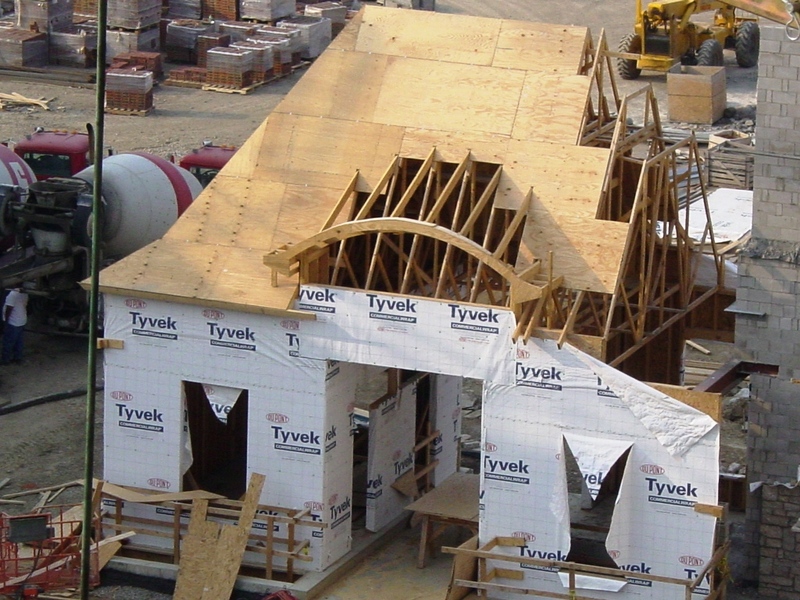 Modern roof frames can be constructed with roof trusses. 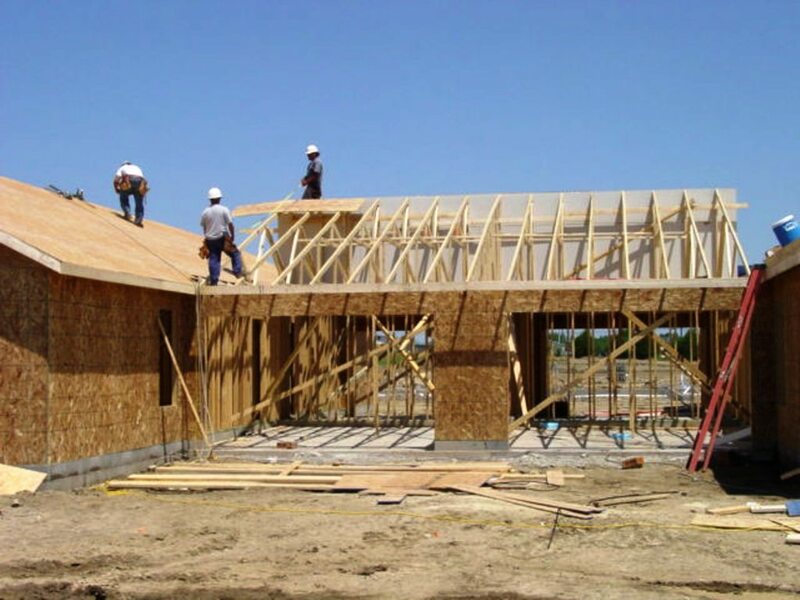 A roof truss is a manufactured, engineered wood assembly that includes diagonal top chords, a horizontal bottom chord, and vertical and/or diagonal webs or braces between the top and bottom chords. Each adjacent member is face connected or joined with metal toothed plates or gussets. The stringer consists of multiple diagonal wood members cut to form the rise and run of the stair. 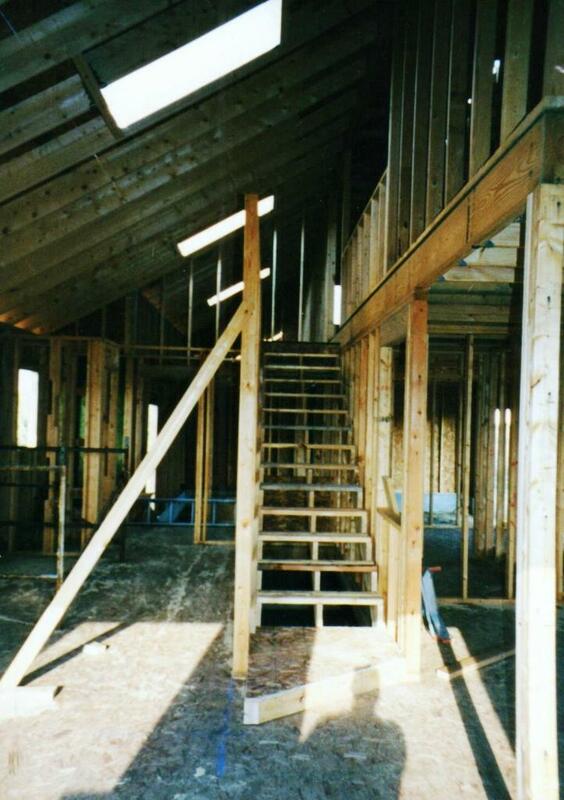 Stringers are placed on the outermost edges of the stair, and often in the center, to support the tread. The tread is a horizontal wood member that is the rough surface of a step. The riser is a vertical member that forms the height of each step. When a step has an open riser, this vertical member is left out altogether. 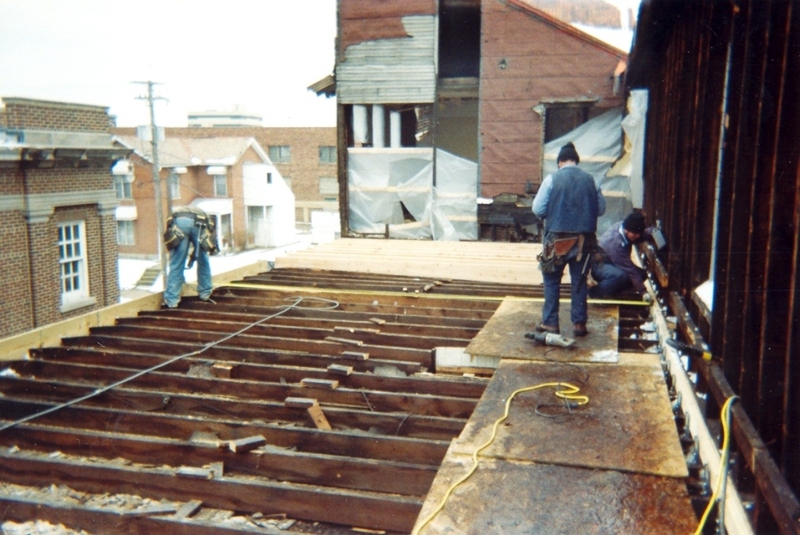 Wood members are cut and joined to create floors, walls and the roof of a structure according to the set of construction documents and local building codes. 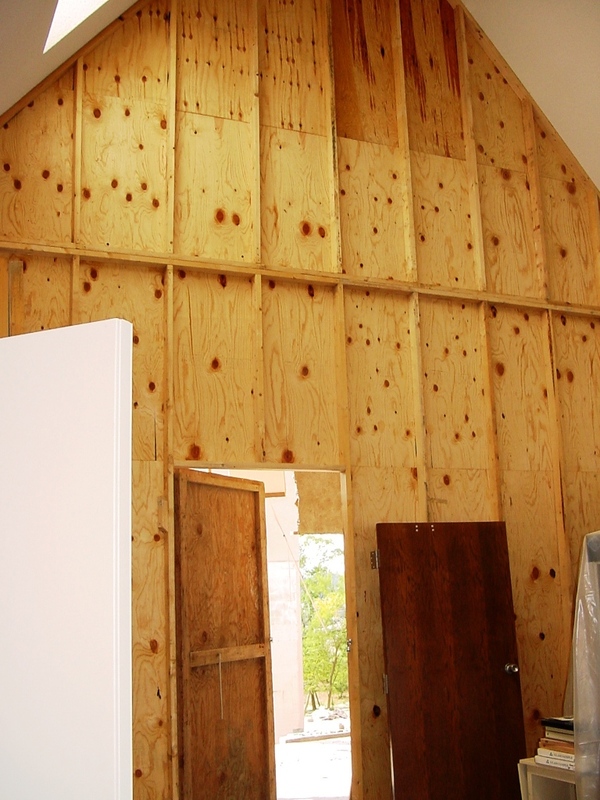 Since the 1830s, two methods of wood framing have been used to facilitate building a structure: balloon framing and platform framing. Balloon framing was used until the mid-1950s. 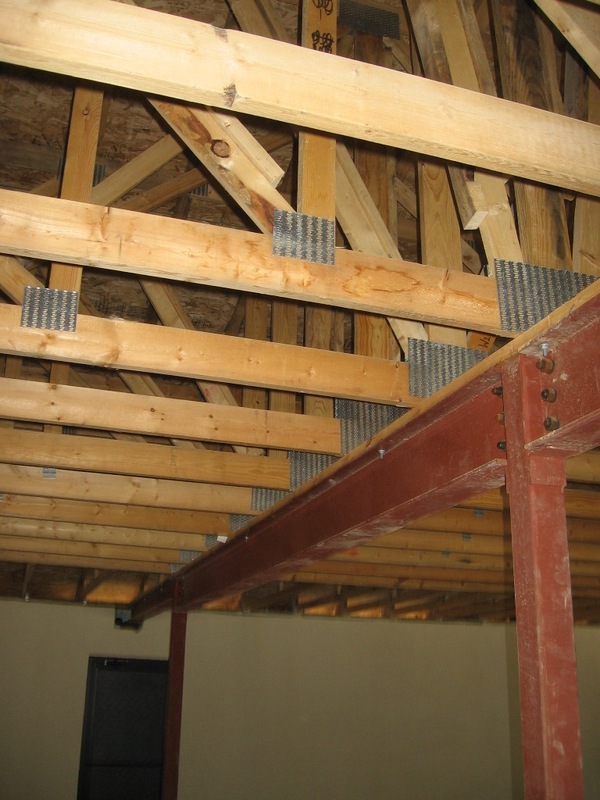 This once popular method, now seldom used, utilizes studs that run continuously from the sill plate to the rafter plate. 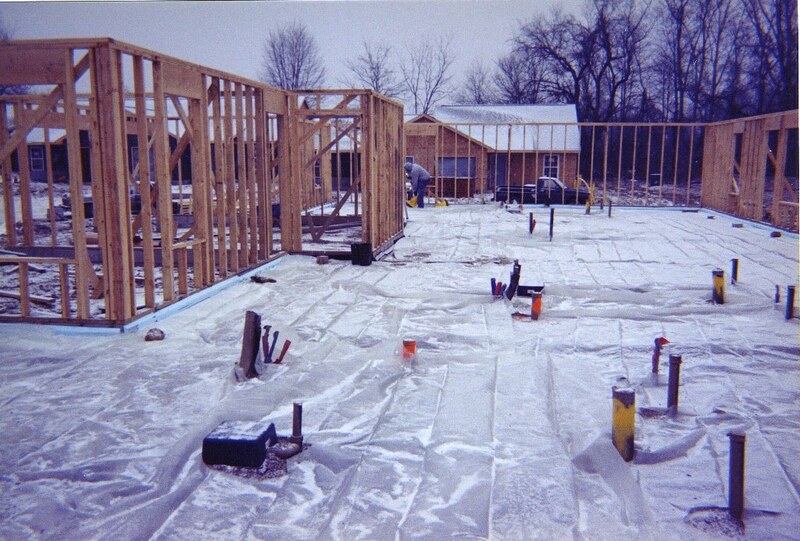 In balloon construction, the floor joists are fastened on top of a ledger board (also known as a ribbon or rib band) which is also fastened to the vertical studs. 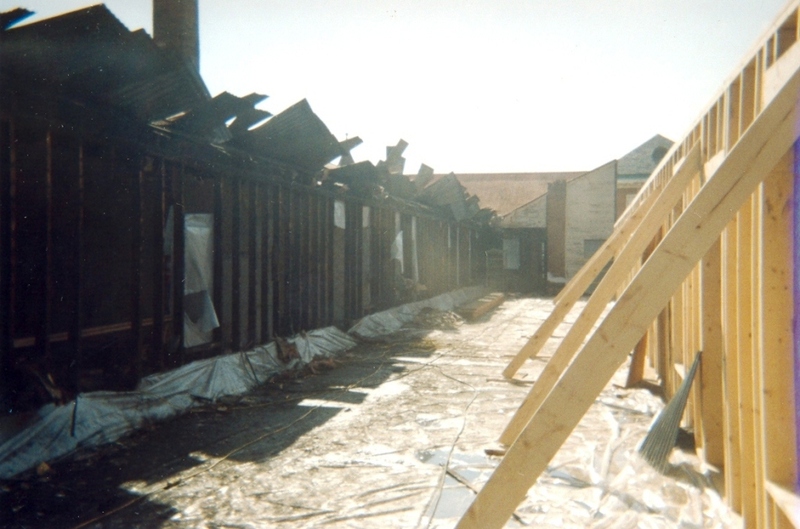 Firestops made of wood blocking are fastened in the spaces between studs and rafters, closing the cavities and slowing the passage of fire. 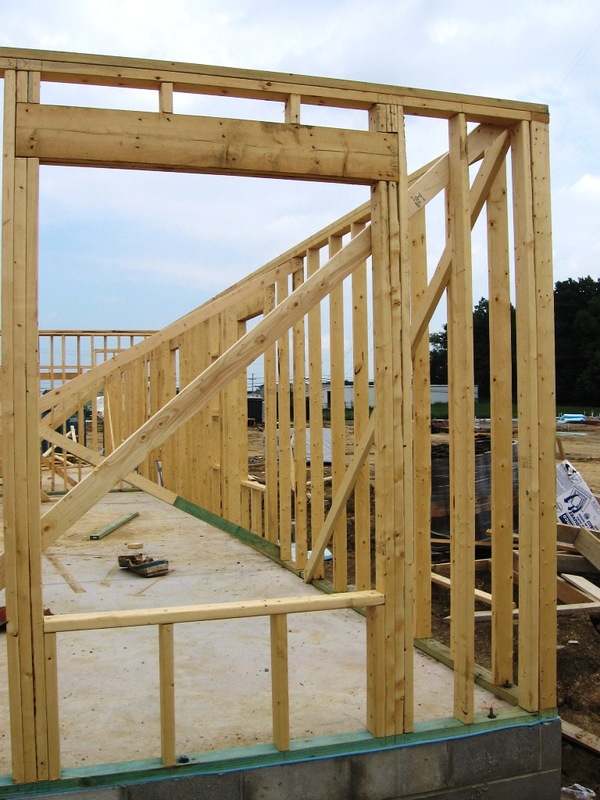 Platform framing is today’s preferred method of constructing wood framed buildings. 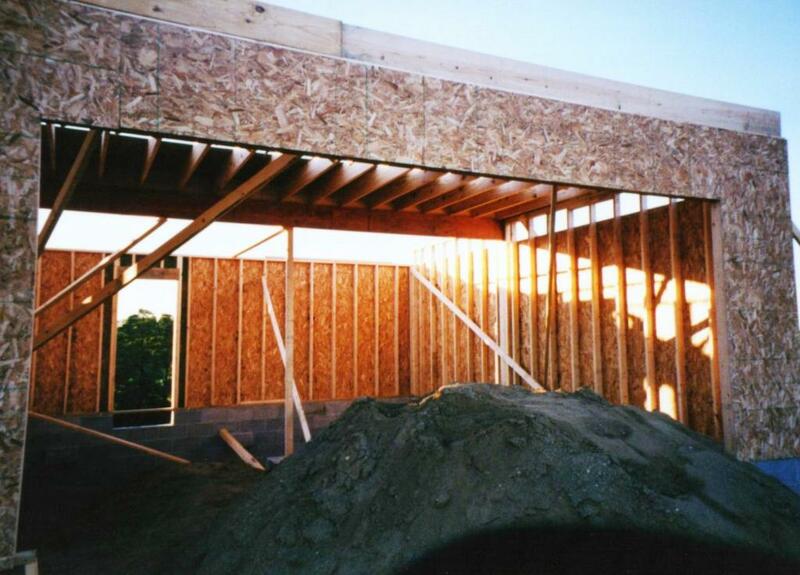 Similar to balloon framing, platform framing is built upon a foundation. 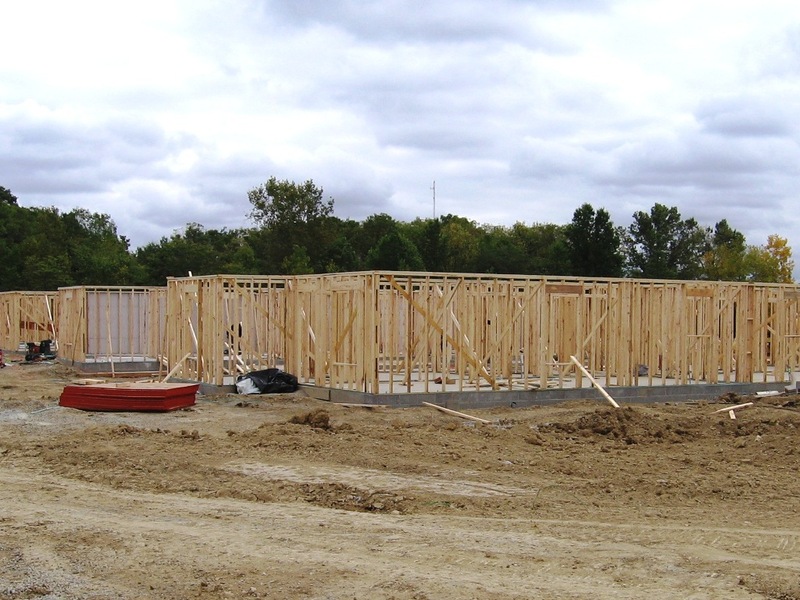 This method starts with a floor frame attached to a foundation, and walls are raised and fastened to the floor frame. Using this repetitive pattern, a carpenter will raise the first and second floors and any additional floors thereafter. 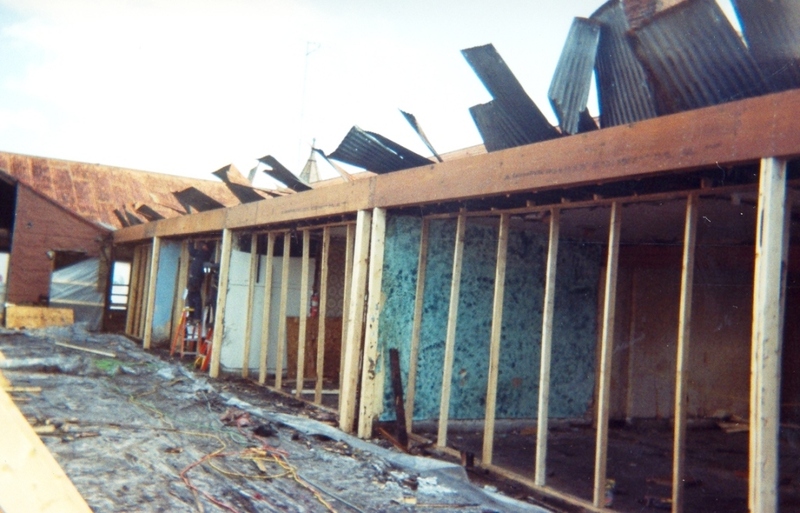 Roof rafters and ceiling joists or trusses are then attached to the top story walls to form the roof. 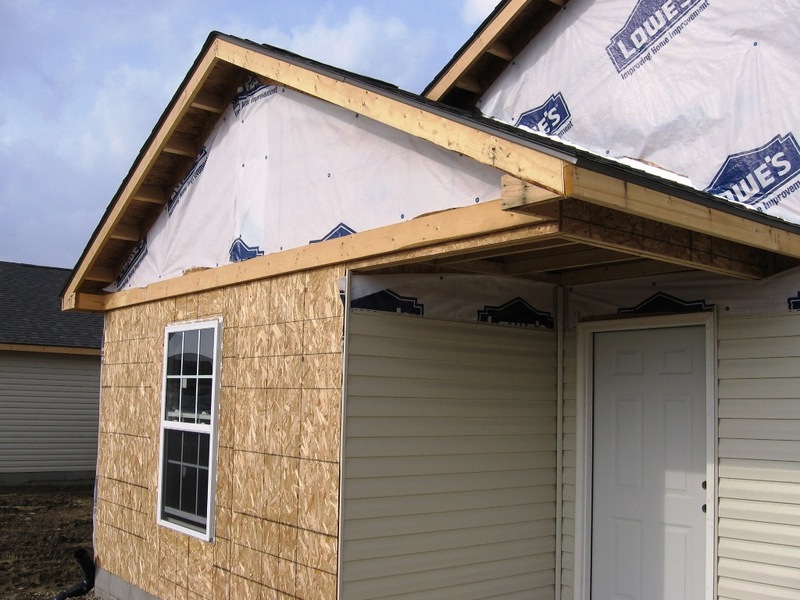 The major advantages of platform framing over balloon framing are: the material size is easier to handle, firestops occur at each floor, and floor frames serve as platforms from which to work on the next level. 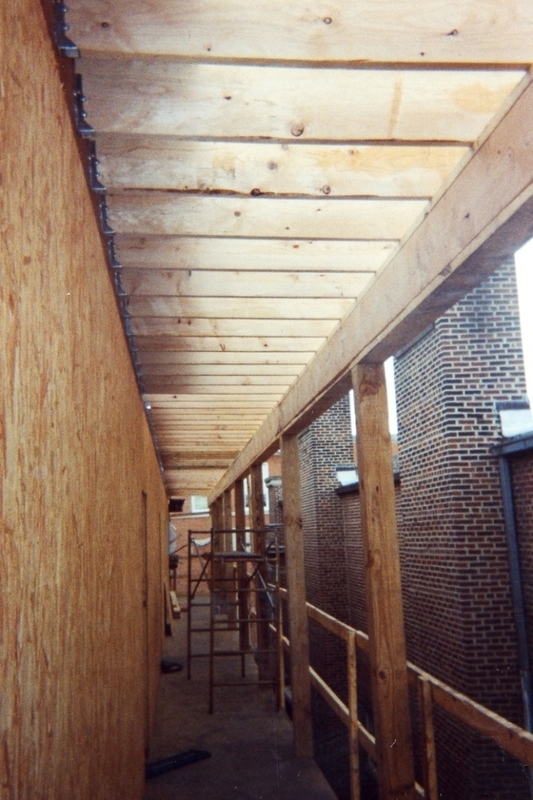 Rafter framing is accomplished in the same manner as platform framing. 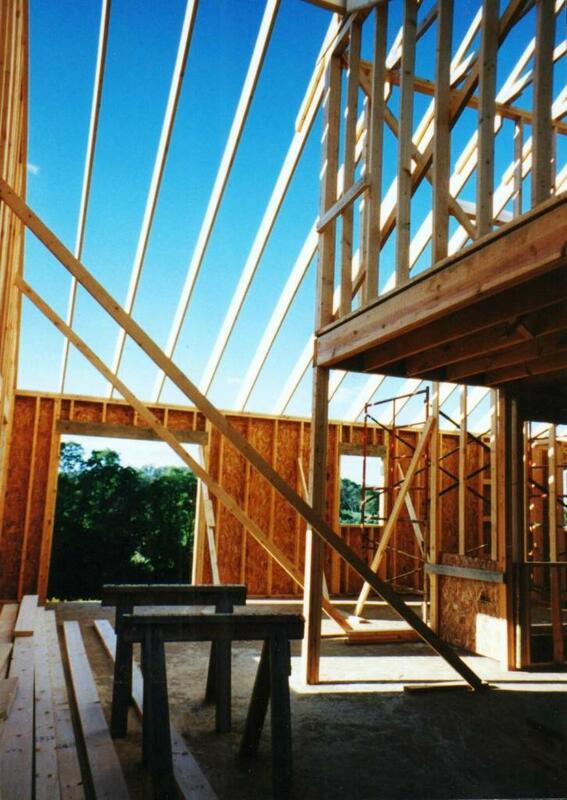 Engineered wood lumber products are manufactured structural components engineered to meet specific design requirements. The process for manufacturing engineered wood makes it more expensive than dimensional lumber, but reduces waste and delivers a product that is significantly stronger and more stable, and more uniform in shape and size. Unlike dimensional lumber, both hardwood and softwood from abundant fast growth tree species are used to manufacture engineered wood. The process of manufacturing is done under tight industry standards. Dry materials are used as wood strands or veneers, which are adhered and compressed into large billets then sawn into standard lengths, widths and thicknesses. Engineered wood products are a high quality substitute for dimensional lumber. They include laminated veneer lumber (LVL), parallel strand lumber (PSL), laminated strand lumber (LSL), wood I-joist and glue laminated beams. 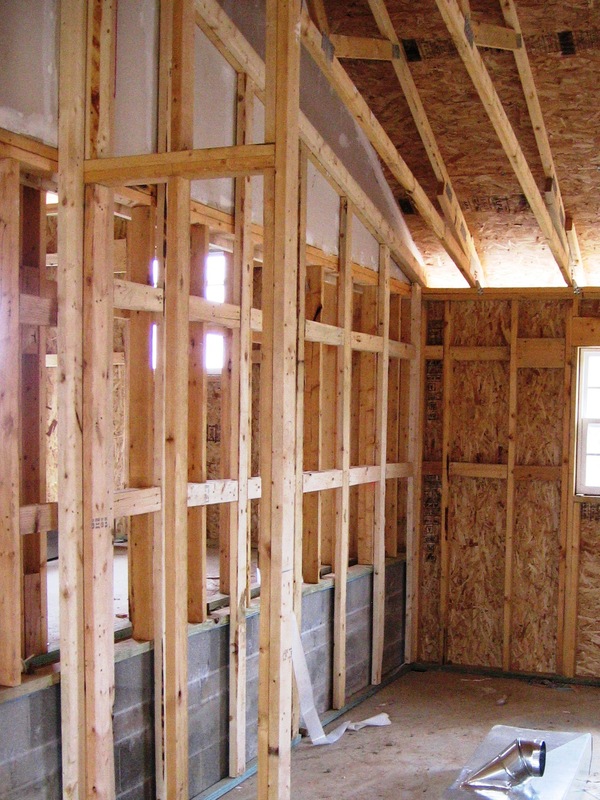 The size of wood framing members is standard regardless of species and is typically stocked at lumber yards in nominal widths of 2 to 12 inches, increasing in 2 inch increments. Pre-cut lengths of lumber start at 4 feet long and, increasing by 2 foot increments, can be found up to 24 feet long. Nominal thickness may be 1 inch, 2 inch, 4 inch, 6 inch or 8 inch. Nominal dimension refers to the size or measurement before drying.